Tom Anderson played Louis Braille for our June, 2013 Braille Carnival. On January 4, 1988 two feet of snow lay on the ground in Denver, and the temperature was around ten below zero. 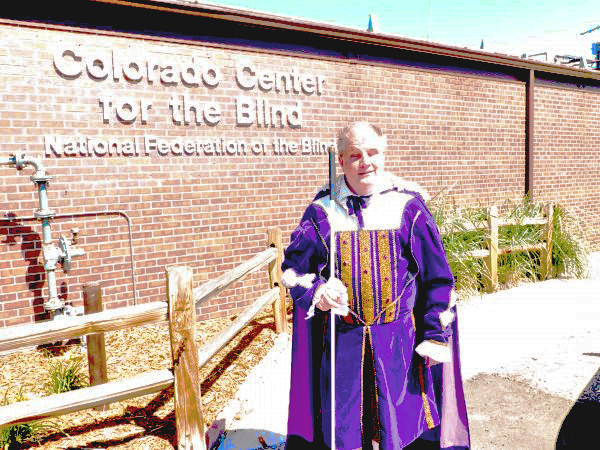 It was the first day of classes at the new Colorado Center for the Blind. Miles “Tom” Anderson was there. In fact, it fell to Tom as Residential Manager to help Travel Instructor Duncan Larsen shepherd the Center’s first five students from their apartments on South Eloti to the Center at Ilef and Broadway. Once arrived, cold fingers and all, Tom began his first day as Braille Instructor/Typing Teacher. He’s been here ever since. Now, after more than 27 years, Tom and Linda have decided that it’s time to turn the page, close this Braille volume and start another. Tom will retire at the beginning of May and he and Linda will move to Overland Park, Kansas to start yet another volume in the book of their lives together. That means it’s time for a celebration, and we want you to come, know that you will want to come if you can, to toast Toasty, Dr. Dots, Mean Miles – our own Tom Anderson! “Having so many nicknames just shows how much Tom is loved,” says Director Julie Deden. If you want to show Tom some love and join us for food, beverage and a short program, please RSVP to Robert Dyson at 303-778-1130, or e-mail rdyson@cocenter.org. When? Friday, May 15, 5 p.m. Lodging is available at the Hampton Suites and Inn for $99 per night, Mention that you are with the CCB to get our rate. The Hampton offers a free van service within a 5-mile radius from 7:30 a.m. to 5:30 p.m. Monday through Friday. They also offer a free Continental Breakfast, Wi-Fi and more. NoNo’s Café across the parking lot offers great Cajun cooking, and many other food options are close by the hotel. Tom was a great Braille instructor! One of my favorite teachers when I was at the center last year! Good luck, and best wishes again, Tom!! !